It’s been a few weeks since I have chimed in for a fashion post. The weather is hot and very humid these days in NoVirginia. It must be August. For those who have been following me on the gram, you know I made a poor life chose last week in regards to my hair. Not only did I get it cut waaaayyyy too short but I strayed from my natural auburn color (with highlights of course) and went too dark. My new call sign – Vampire Mistress of the Dark. It;s been a huge lesson in impulse control and vanity. Thankfully, I will get the color fixed on Thursday. I cannot wait. This weekend I wore a blouse form eshakti with a long gold pencil skirt and navy heels. The only photo I have was taken in my office and I look horrid. Two blemishes on my face, the hair from hell and I only got about three hour sleep (darn Olympics). I have begun to wear white once more. When my sweet Courtney was alive, I would not dare. One sneeze while eating her favorite spinach soufflé and stain removal became an olympic challenge. The color is slowly making it’s way back into my closet. As y’all know, blue is my favorite color. I love any shade. It plays a prominent part in my wardrobe. 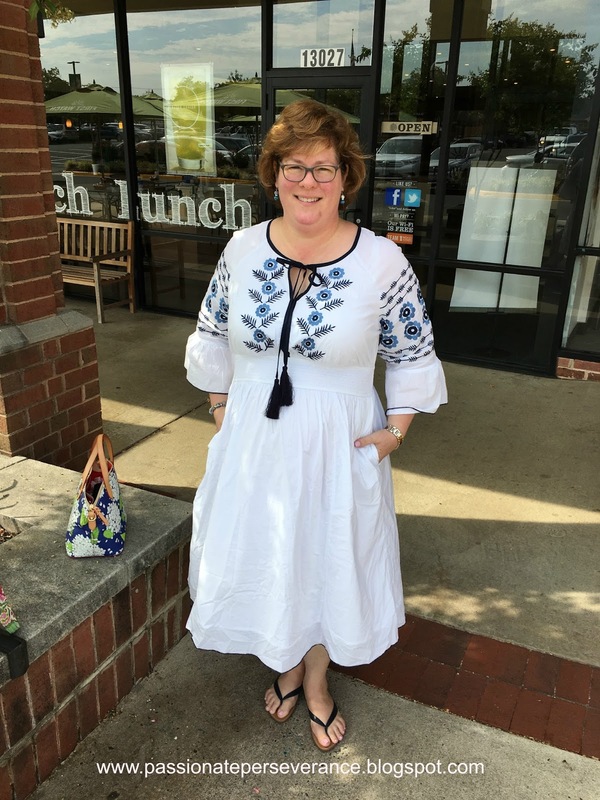 This dress from eshakti has beautiful embroidery in shades of blue which pops off the crips white cotton. It has a four inch elastic waist that really helps me look slimmer. It cinch’s me at the smallest part of my waist and then gently floats off my largest part. It’s light, feminine and quite comfortable. We will ignore the lovely zits my non made up face. Always keeping real here my friends. Next up we have another dress in shades of blue. This one reminds me of water. I bought it at DressBarn two years ago I think. Again it’s got that empire waist that is my go-to in the figure flattery department and then a gentle float away from the pufferfish belly. It’s also wash and wear which for this working gal is key for ease of wear and care. I have truly embraced the sleeveless bodice this summer. I have never been comfortable with my east german swimmers arms but I am finally at a certain age that I know this is how it’s going to be. So embrace it I shall and sweat I shall not. Next up is an outfit I wore to work this week. I love this longer sleeveless tunic. Vertical stripes are a plus size woman friend. The white slacks are just a dream to wear. They are a slim fit and so comfortable. I never thought I would wear white slacks and actually like them but I really do. Both pieces are the house brand from Nordstroms. Their twice yearly sale makes a clothes purchase of higher quality garments possible for me. There you have it my friends. I can’t wait for Thursday so I can fix the great hair debacle of 2016. The lesson from this is when feeling a great need for change, call your best friend or your husband to chat about said change before entering the Vampire darkness of a horrid impulse move that will make you cry. 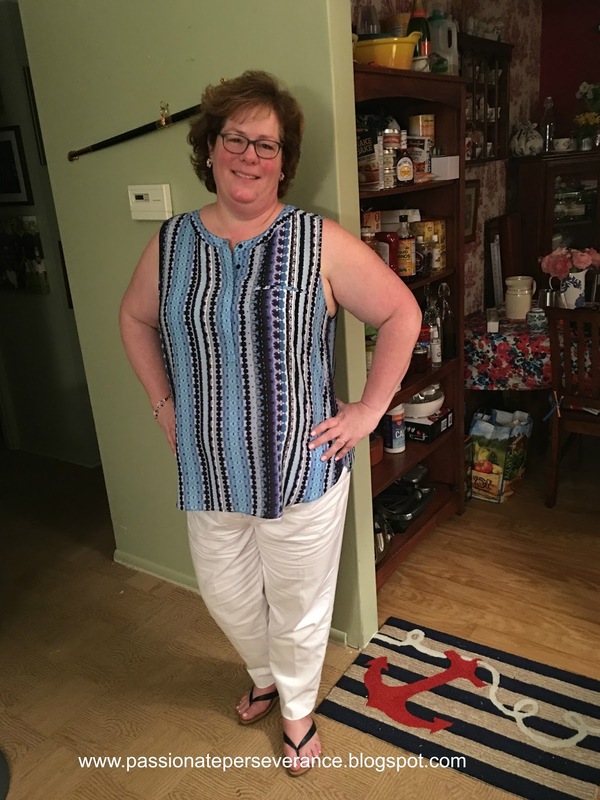 Head on over to Rosie’s a blog for my mom to check out some other fabulous women sharing their summer fashion choices. I love the blouse with the birds! I have one dress with feathers as a pattern, and it always makes me happy. Trying to get more adventurous with my patterns! Patterns can be so much fun Kirby. They really allow some versatility. I love that white dress with the blue. So pretty! It's one of my favorites. Thanks Amelia! I really like your dress choices! Beautiful! I hope you have a blessed day! You look so great. I love blue of every shade too (my outfit for Mass this week reflected that well..!) and I love that blue flower pattern dress. Great colors, great shape! All your pieces look great though. Love the embroidery on that white dress! I'm such a sucker for embroidery in any form 🙂 You look great as always, friend! We are always more critical of ourselves than others… had you not mentioned the "flaws," I wouldn't have even noticed. You look great! If you see this, could you comment on the quality of eshakti clothing? It's an intriguing concept. 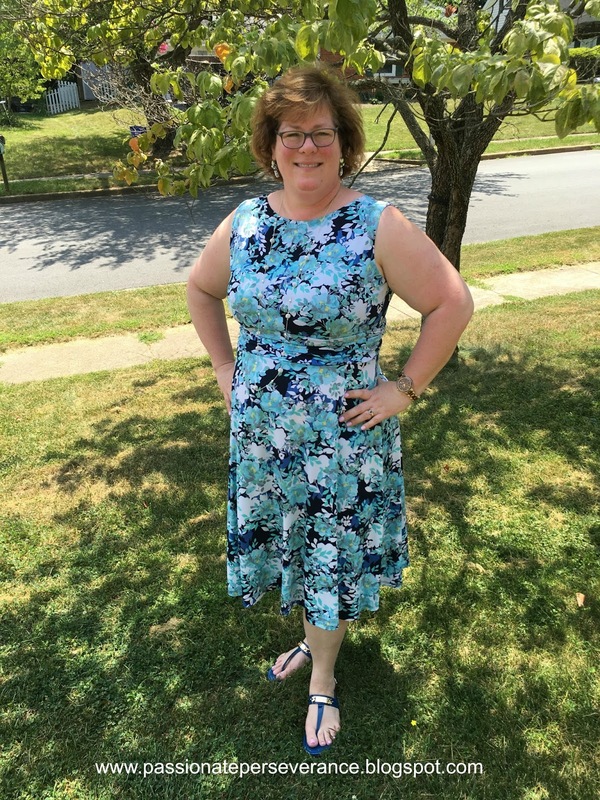 Kerri – I love eshakti. They line their dresses and the quality of construction is very high. They wash well too. Love them. I completely agree. You're too hard on yourself Mary!! !